(Nanowerk News) Bong Wie has heard the snickers. Wie has a serious reply: After five years of science and engineering work, Wie and his small team have a publication list of 40-plus technical papers, $600,000 of NASA research support and a proposal for a $500 million test launch of an asteroid intercept system. Plus, Wie has just been invited to show off his research as part of NASA's Technology Day on the Hill in Washington, D.C., on April 17. A satellite carrying a nuclear device would be launched into orbit. The satellite’s trajectory would intercept an incoming asteroid that’s 50 to 300 meters (164 to 984 feet) across, the typical size that threatens Earth. 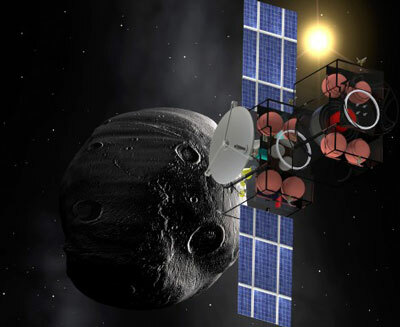 The satellite could travel up to 30 days to reach the asteroid. The satellite would hit the asteroid at a speed of 10 kilometers (6.2 miles) per second, creating a large crater in the asteroid. Just before impact, the nuclear device would be released from the back of the satellite, creating a slight delay in detonation and allowing the device to fly into the middle of the crater. The explosion from inside the crater would blast the asteroid apart. “The overall effect of an explosion under the surface is 20 times larger than an explosion on the surface,” Wie said. The asteroid chunks would spread into a large debris cloud. By the time Earth reached the cloud, Wie said less than .1 percent of the chunks would enter the atmosphere. And those should only be 5-meter (16-foot) pieces that aren’t likely to do much harm. He was looking for a new research direction and in 2008 was able to use some money from his Coffman Faculty Chair position to establish the Asteroid Deflection Research Center. Money from the Iowa Space Grant Consortium also supported the center during its early days. There wasn’t much of a research budget until the center won a $100,000 Phase I grant from the NASA Innovative Advanced Concepts program (NIAC) in 2011. The center won a $500,000 NIAC Phase II grant last fall. Even with the grants, it’s still not a big operation: There’s Wie, there’s John Basart, a professor emeritus of electrical and computer engineering who’s volunteering his time, and there are eight graduate students. Center researchers have published and delivered papers such as “Conceptual Design of a Hypervelocity Asteroid Intercept Vehicle (HAIV) and Its Flight Validation Mission” (pdf) and “Guidance Algorithms for Asteroid Intercept Missions with Precision Targeting Requirements” (pdf). Basart has been busy studying and calculating the potential use of the Yarkovsky Effect to slowly redirect the orbital motion of an asteroid. The phenomenon takes into account heating cycles of an asteroid and how that solar energy can actually cause an asteroid’s orbit to shift slightly. But, he said researchers had better prepare. Iowans should know. A 2-kilometer (1.2-mile) asteroid struck what is now Manson some 74 million years ago. That impact created a crater, now buried well below the northwest Iowa topsoil, 22 miles wide and 3.5 miles deep. And geologists say recent aerial surveys have confirmed a 200-meter (656-foot) meteorite crashed into what is now northeast Iowa’s Decorah some 470 million years ago. That impact left a crater – now underground – that’s 3 miles in diameter. To date, Wie, his Iowa State research team and Brent Barbee of NASA’s Goddard Space Flight Center in Maryland have been working with data generated by computer simulations. Wie said it’s time to integrate the necessary technology, build an unarmed prototype satellite and launch an actual test to see if a target asteroid can be hit. He thinks the answer is yes because NASA engineers and scientists have already accomplished a very similar mission. In July 2005, the impactor from NASA’s Deep Impact Mission crashed into Tempel 1, a comet that measures 7.6 by 4.9 kilometers (4.7 by 3 miles). The impact was designed to create a crater 25 meters deep (82 feet) and 100 meters wide (328 feet), exposing the comet’s interior. The mission’s flyby spacecraft passed over the crater to take pictures and collect spectroscopy data. And so Wie is writing up a proposal for a $500 million test mission.